The Mediterranean conjures images of warm crystal clear water, island forests with aromatic wild herbs and incredible ancient history. Not only have people in this part of the world cracked the secret of good living, some communities in this area are among the longest lived in the world. 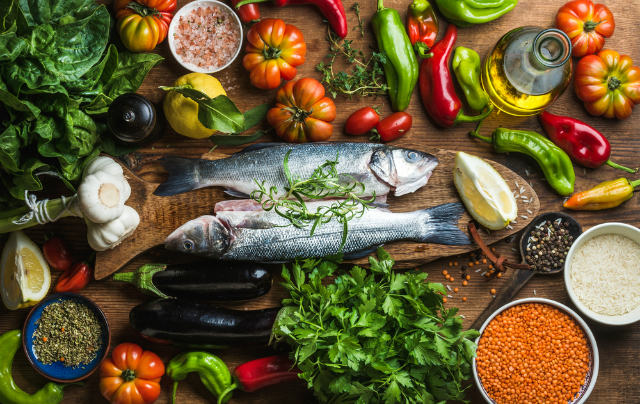 The Mediterranean diet has been extensively studied and associated with better metabolic health, which translates to a lower risk of type 2 diabetes, heart disease and stroke. One study even demonstrated that older adults who adhere to a Mediterranean diet may maintain a higher brain volume which may explain why it is protective against dementia. The traditional diet is largely based on vegetables, whole grains and legumes, which provide lots of micronutrients and fibre. In studies of large groups of people followed for many years, fruit, legumes and vegetables were all associated with a decreased risk of mortality. These foods should make up the majority of what you eat. Fish contain high amounts of omega-3 fats, vitamin D, selenium and are an excellent source of protein. Eating two serves of fatty fish, like salmon, mackeral or tuna, per week can decrease the risk of dying of heart disease by 36%. Red meat has been shown to increase the risk of bowel cancer. Processed meats, like salami and ham are particularly harmful for health and are considered carcinogens by the World Health Organisation. Small amounts of grass fed red meat can be included occasionally, but overall red meat and poultry should be considered a treat not a staple. Supplementing a Mediterranean diet with these foods high in healthy fats can further reduce cognitive function, above and beyond the diet itself. Substituting olive oil for margarine or butter is an easy way to improve your brain health. In traditional Mediterranean societies, only small amounts of wine are drunk with meals. The evidence is still not conclusive on whether there are health benefits to these small amounts of alcohol, as some of the longest surviving groups in the world don't drink any alcohol, so there is no need to be concerned if you choose not to drink alcohol. Following a lifestyle of farming and fishing involves significant physical activity. Although those of us living in a traditional Western society only have to walk as far as the fridge to get our food, there are many opportunities to include more incidental exercise, like walking to the shops instead of driving. Eating food is so much more than putting petrol in a car, creating meals and sharing them with others is a way of strengthening social connection. High levels of social engagement and connection, not only enrich day-to-day life, but are actually associated with longevity. Everyone deserves to eat food that makes them feel good and helps them to be as healthy as possible. Using these simple dietary guidelines can provide a map to a long life of wellbeing. Just remember to enjoy it with someone you love!